Following the successful completion of my first Alpha Legion Squad, i was keen to get a vehicle done to see if the scheme worked as well on tracked armor! This Sicarian was originally earmarked for my Heresy Death Guard. However, it was intercepted en route by a Alpha Legion task force and brought to the Legions forges for....reassignment! 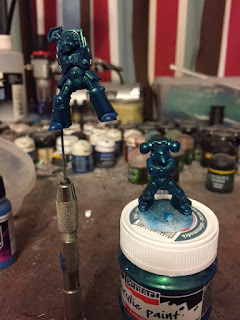 The only criticism of my Alpha Legion scheme is the shading. 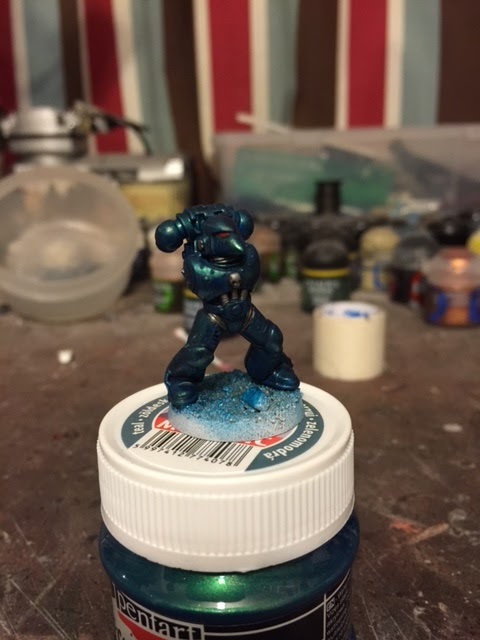 While the watered down Asurman Blue did a good job of the shading on an infantry model, i wasn't so confident it would cut it on a larger piece. I have seen zenital highlighting/basecoating done before but i have never tried it. Seemed simple enough, so i decided to give it a go here. As i had already undercoated the Sicarian in white, i used an airbrush to apply some black to the areas i wanted a little darker. A little backwards, but i hoped the effect would be the same. I applied my transitional Teal paint with the airbrush and this was how it turned out. It is definitely darker where i applied the black, but perhaps a bit to dark... I do like it, but feel that if i had used a grey shade instead of black then the shading may have been a bit more subtle, and of course not quite as dark! I will see this experiment through to the end and complete the tank, but i think i'll use a grey for the shaded areas next time and see how it looks. I'm still very happy with the transitional Teal paint, and i'm sure it will look even better once the blue wash is on. 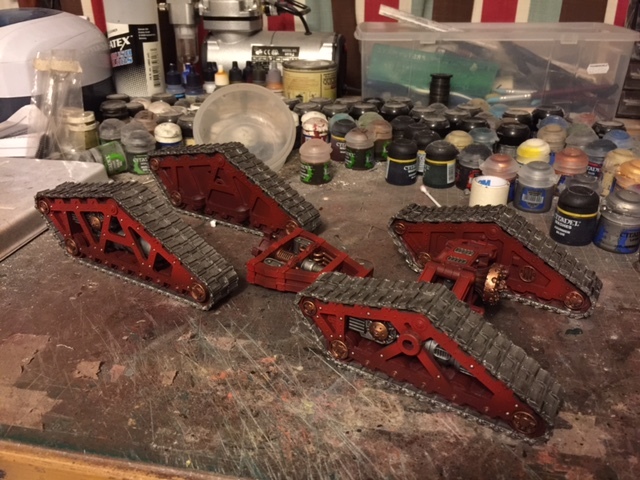 Phew, it seem's that i have finally managed to wriggle free of the Hydra's coils for a few moments and get some more work done on the Mechanicum Ordinatus! By some work i mean nearly finished! Its come a long way since my last post, with all of the base colors down, along with washes, second coats, and highlights. Below you can see the sponson mounted Volkite Culverins that the Ordinatus packs. I have magnetized these purely for ease of transport as they're likely to ping off if glued on. The main drive unit is complete. The main weapon carriage is also mostly complete - and i have to say it is rather impressive! 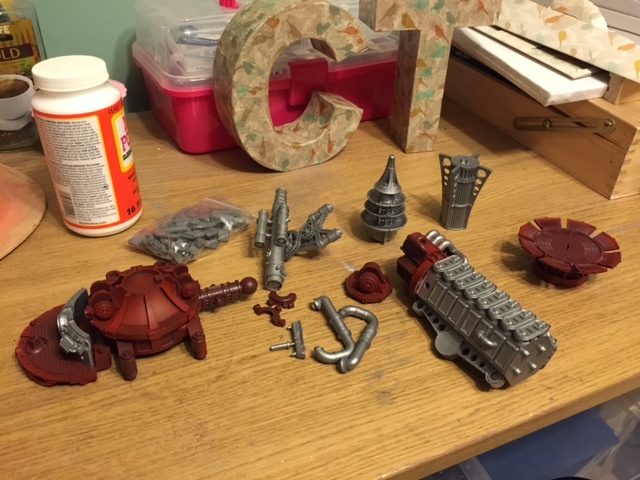 These bits were rather fiddly to paint, even un-assembled. 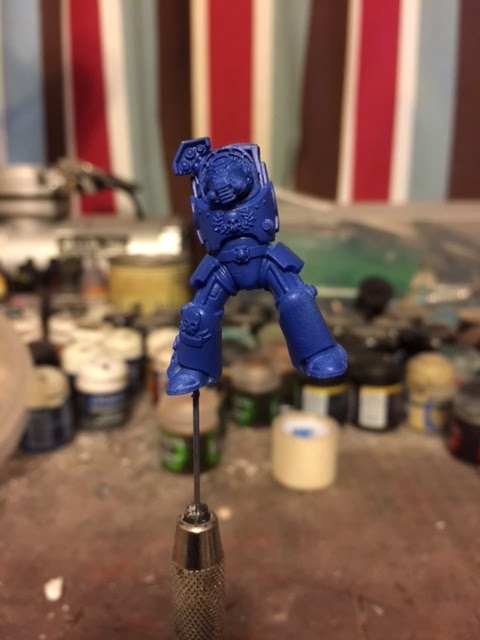 I followed the Forgeworld's painted example of the Ordinatus fairly closely, but did decide to add some extra brass trim to the main weapon. The control console is also sporting a Volkite Culverin turret! I left the weapon un-glued for easy removal. The join meant that i didn't have to magnetize this weapon. You can see the control console a bit better here. I'd like to add some detail to the display screens before i'm finished. This is the targeting array. I had a lot of frustration with the lenses of the array, i just couldn't get them right! I'm happy with the blue lens, but the red and green lens may see some more attention before i'm done. The array has also been magnetized for transportation purposes. Very close to completion now! Just have to do the bits that are still bugging me (lens, display consoles) and the two Mechanicum crew. Once started it didn't take me long to get the squad finished. To be honest, i haven't enjoyed painting this much for a long time! I think its the use of different colors and paints that's making this project that much more interesting. This is the squads Sergeant, marked out by the different markings on his helm. 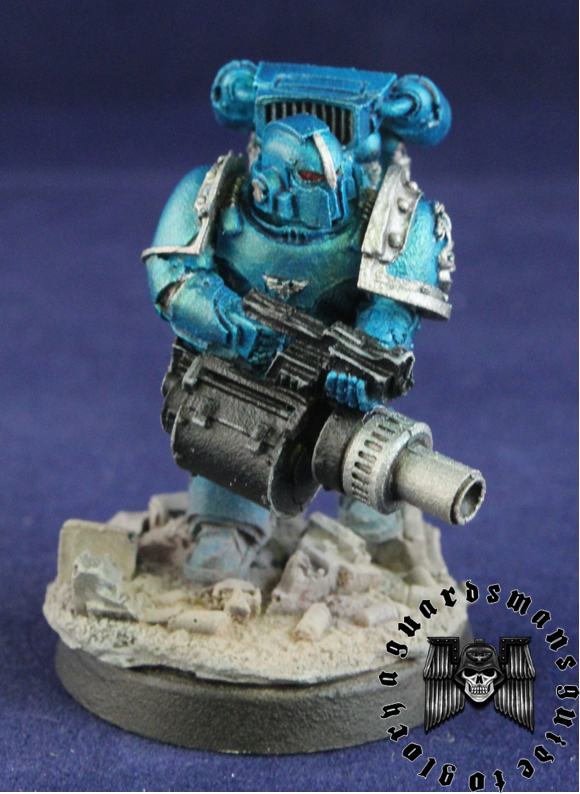 Legionary with a missile launcher. Yes i know it looks like a grenade launcher! 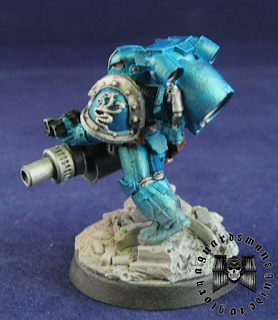 Apparently its a missile launcher according to Forgeworld! 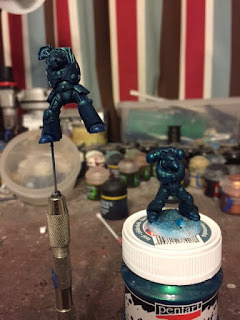 Some details of the jump pack and Alpha Legion Markings. This squad will be tasked with weakening enemy characters with their Rad weaponry and attacking key armored targets with their Melta Bombs. It will be quite a costly unit for a 5 man squad, but we'll see how effective they are in play. 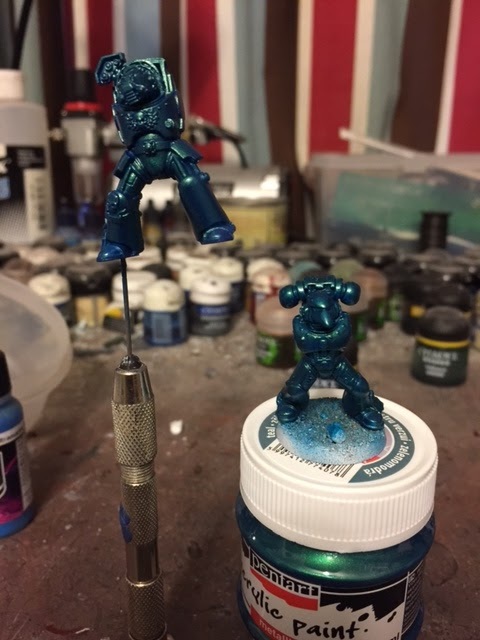 Overall i am very please with how this color scheme has turned out, and now i'm even more excited about the Alpha Legion army! 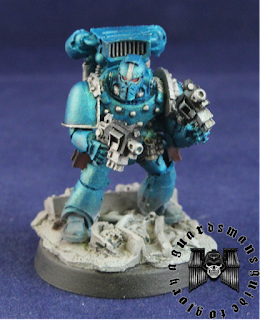 While working on the Ordinatus my mind kept wandering to the Alpha Legion test mini i did the other day. I really felt the need to get the color scheme down on some proper models....i really needed to scratch that itch! So i put the Ordinatus aside for the time being and rummaged through my box of shiny new minis. I didn't want a character model, not until i was happy with the colour scheme, nor a large squad that may be to laborious to paint. So i picked out a 5 man Destroyer Squad to get me started. Destroyers are not something I've considered in the past (strange considering i play Death Guard!) 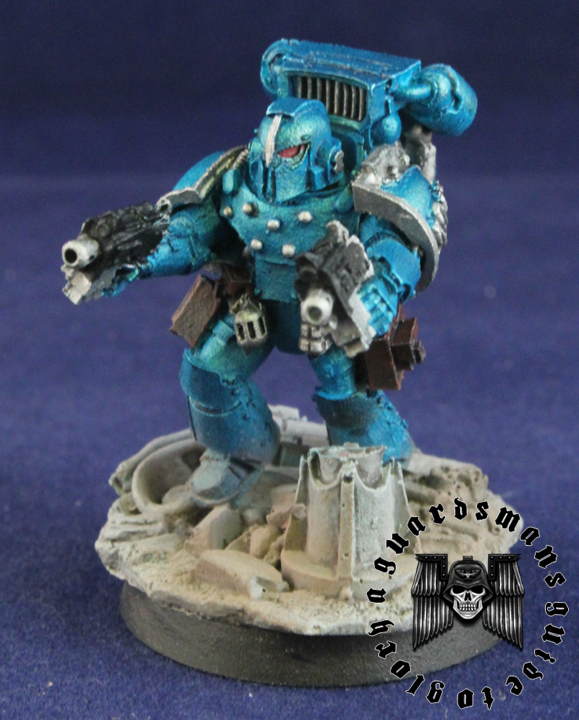 but they seemed to strike a chord with me for my Alpha Legion force. Weapons of terror seemed apt for the masters of subterfuge, and i could see these guys causing chaos behind enemy lines with their rad grenades and phosex bombs. But first! I got the squad assembled and swapped out their heads and shoulder pads for some Alpha Legion heads and pads. The sharp eyed of you may notice the very old Citadel Urban Basing kit added to these bases, which i cast up some time ago. As this was the first army of mine that would be mounted on the new 32mm bases, i needed to fill up all that extra space! In fact, the basing kits spill over the sides of the 32mm bases just slightly which gives them a nice display-piece kind of feel. The Destroyers were undercoated in white. Then sprayed in my transitional Teal paint. 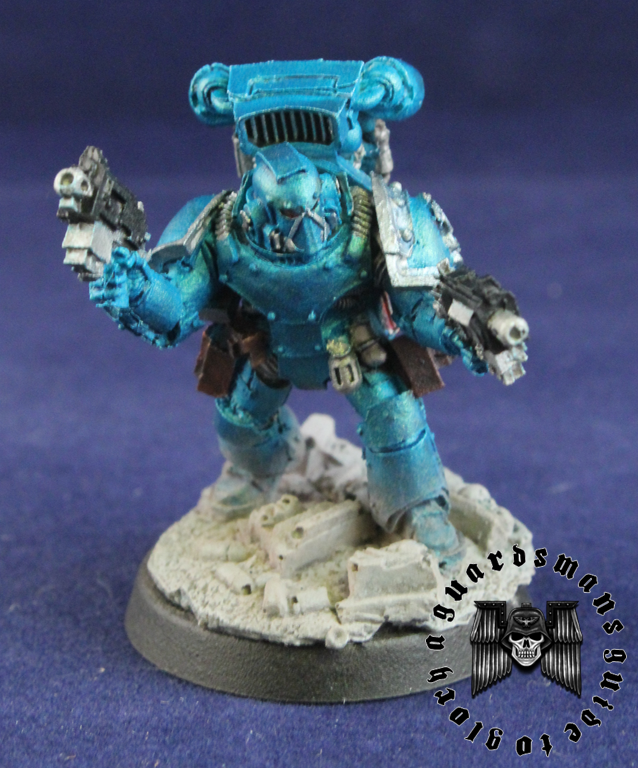 I then went on to apply a slightly thinned down Asurman Blue wash over the whole model. I didn't photograph this as it didn't show up very well. Next up it'll be onto the details. Somehow, a Mechanicum Ordinatus Ulator made its way into my Alpha Legion order recently....To this day i still don't know how that happened, Perhaps a gift from the Hydra! So, not being one to question these things, i began working! The Alpha Legion will have to go on the back burner for the time being. To be fair, it hasn't changed much since that imaged was shown that weekend so my love for it hadn't diminished. Now just over a year later, I've got one of my own on the go. Oh, and if you haven't read the rules for this beast, go and do it NOW! Its a monster on the field, the bane of tanks and armor at huge distances! Its about a foot long, fitting for a tractor on steroids carrying a titan-class weapon on its back! 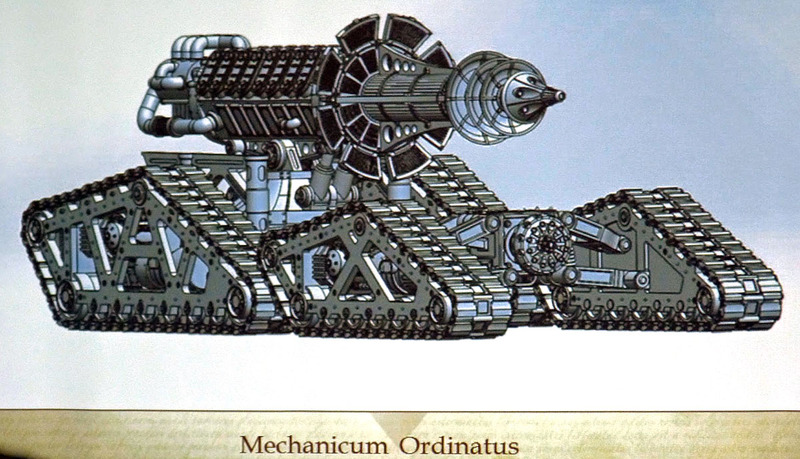 Its full of detail of course and maintains the great visual cues that are found throughout the Heresy Mechanicum range. These are the parts for the weapon itself (a Sonic Disruptor if memory serves) I should be making a start on these parts soon. 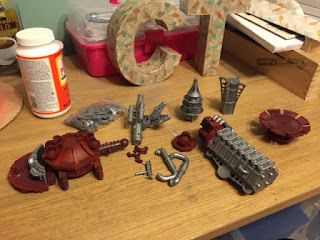 as the Mechanicum models are so detailed, i'm having to paint most of the parts before assembly, which is lengthening the process somewhat. After finding my hobby direction again in the form of a few Imperial Knights, i got to thinking Heresy again. Its nice painting big models, but after a while i really fancied painting some infantry. With not a great deal of infantry lying around, this meant a new army! Fortunately for me, i had been recently been inspired by the new HH novel 'War Without End'. In particular the short story 'The Harrowing'. In brief its a short story about the Alpha Legion and their infiltration of a Mechanicum bulk transport full of Titans! I won't spoil it for you if you haven't read it, but it was very cool and i really liked the way the Alpha Legion operated. They weren't a Legion that i had really taken much notice of in the past, but this story gave me a new appreciation of them. I especially like their 'Legion Flaw', where they were compelled to ensure that the enemy knew how awesome they are and how much the Alpha Legion had royally screwed them before their inevitable deaths! If they don't achieve this, then they felt that they haven't fully completed their mission. Pretty quirky. So what does this mean for the hobby? Well, a brand new Alpha Legion force of course! I didn't go to mad, just a few squads, transports, snipers, jet bikes, etc (:-S) My force will be more designed to be an ally to fellow Traitors rather than a stand alone force. We'll see how it goes. So my models arrived the other day, but before i broke them out, i had to nail down a decent colour scheme. I had trawled the internet for a scheme i liked: blue with a bit of green, green with a bit of blue, cyan, teal, the list was a bit endless! 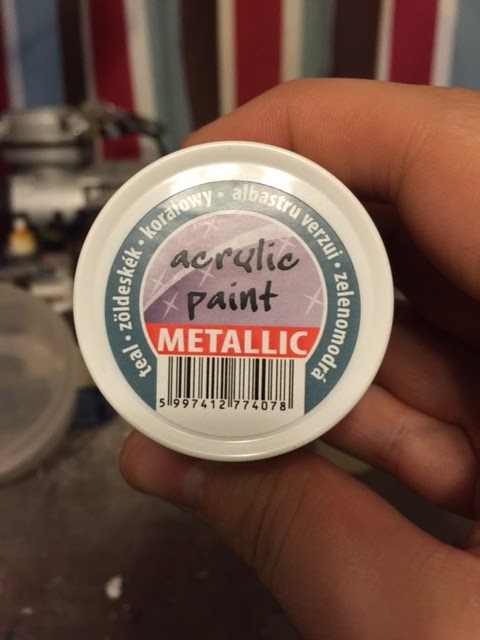 Then i stumbled upon one hobbyist's efforts with a metallic transition paint with pretty much all of the above rolled into one! 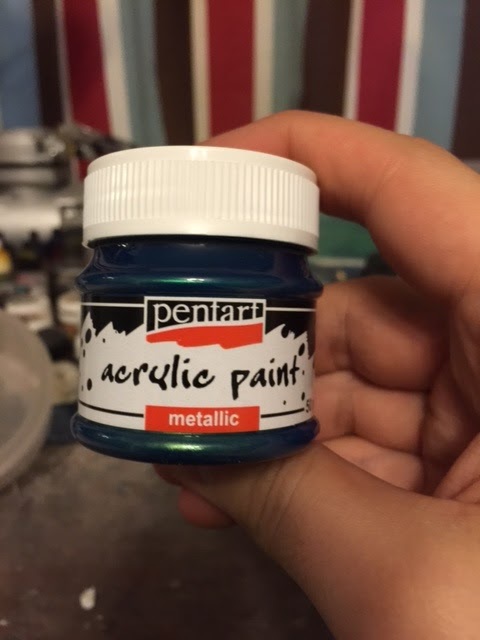 This is it, a metallic paint by Pentart, the colour designation is Teal. It creates a beetle carapace-like effect which i really loved! The hobbyist had applied this paint to a full squad of marines and a Spartan, all of which looked totally cool! So i jumped on eBay and grabbed myself a pot for £5.99. A little steep, but its probably the only pot i'll need for the whole force as its quite big. Looks great, but you can see how the blue undercoated Terminator on the left produced a darker colour than the white undercoated marine (which of course was expected) I wanted to apply a blue wash over the top of this to provide some quick shading, so we'll see how they fare after that. You can see now how the Terminator is a lot darker now following a Asurman Blue wash. While the shading is good, i felt that it had darkened down the base colour a bit to much. A bit more work would be required to brighten up the base colour. The Marine on the right fared better though, so i proceeded with that test mini. I picked out a few of the details, metallic silver forming the bulk of the additional detail. These were washed with Nuln oil and the eye lenses were picked out in red. If this was a proper mini then i would go over the silver again to brighten it up a bit, but i just wanted an idea at this point. I also brightened up the base colour at the apex's with a thin layer of the original colour. 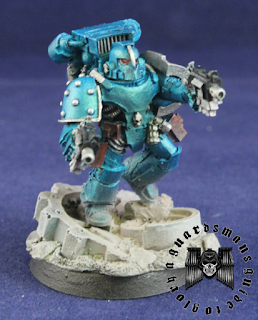 Once some Alpha Legion shoulder pads are on and this guy is packing some heat, then i think the colour scheme will look pretty ace! For now this will be the recipe i'll go with. Now, time to put together some FW minis and get cracking!